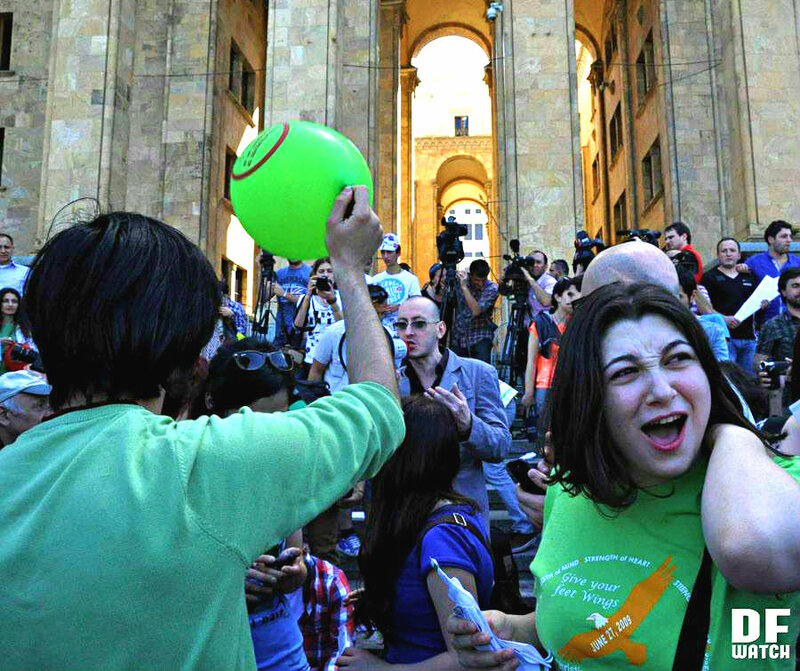 TBILISI, DFWatch–Youth in Georgia also this year plan to demonstrate for decriminalizing marijuana. On June 2 last year, there was a large rally outside the old parliament building in Tbilisi for legalizing pot, and this year’s rally is planned at the government office. A few weeks ago, Beka Tsikarishvili, who works for a local NGO, was charged with purchasing and possession of 65 grams of marijuana, for which he may be jailed from seven to fourteen years. Young people, artists, actors, singers and other people started campaign under name ‘Beka is not a criminal’, publishing video clips, blogs and posters on the Internet demanding to decriminalize marijuana. The plan is to start Saturday’s demonstration at Tbilisi State University and walk to the parliament building on Rustaveli Avenue. Organizers call on all who are interested to bring with them things that make a noise. They protest against the strict legislation which punishes use of marijuana and punishes dealers and users in the same way. On Friday, campaigners issued a manifesto, which says that Georgian citizens protest the unfair principles and categorically demand to stop the violent drug policy. “We don’t plan to stop protesting the specific case. Every person who express solidarity with Beka, fight for their own and society’s liberty,” campaigners say. They emphasize that their goal is not to promote the use of drugs, but to show solidarity and empathy. A Facebook page with the same name has gathered more than 5,000 supporters. Beka Tsikarishvili has recorded an appeal https://www.youtube.com/watch?v=N6qjs1SBxW8 in which he says that his problem concerns many other people. He says he has personally experienced Georgia’s strict drug policy. He spent 18 days in prison and was released on bail. For a year, he has had to argue that he is not a criminal and he doesn’t need to be isolated from society. He appealed to the Constitutional Court demanding to abolish the strict punishment in such cases. Tsikarishvili was detained in June, 2013, when police found marijuana after searching him. He paid GEL 10,000 (USD 6,000) bail after spending 18 days in Prison No 8 in Gldani, Tbilisi. There will be protests on June 2 also in Batumi, Kutaisi and Zugdidi. In Tbilisi there will be symbolically colored smoke.